Wudaokou has a lot of cafes to go around, but it’s not easy to find the perfect one for a study session on a lazy afternoon or for a snack before/after Lush/Propaganda. The Bridge has delicious club sandwiches but is almost always smoky and crowded. Sculpting in Time has pretty terrible food (as does Avocado Tree so far, if they’ve improved please let me know)…but now, may I suggest: Maan Coffee! 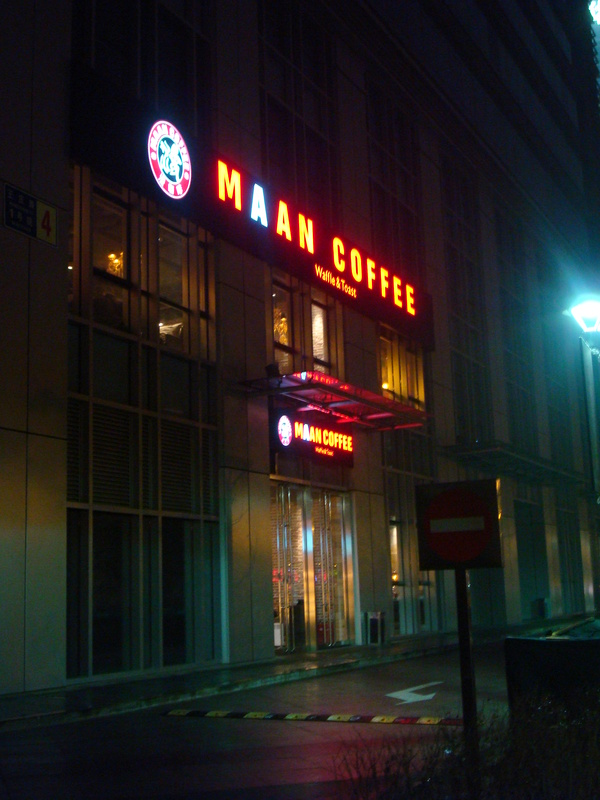 Maan Coffee is also deeply Korean. If you’ve ever visited Seoul, this will feel instantly familiar – the city seems to have as many waffle joints as barbeque restaurants. 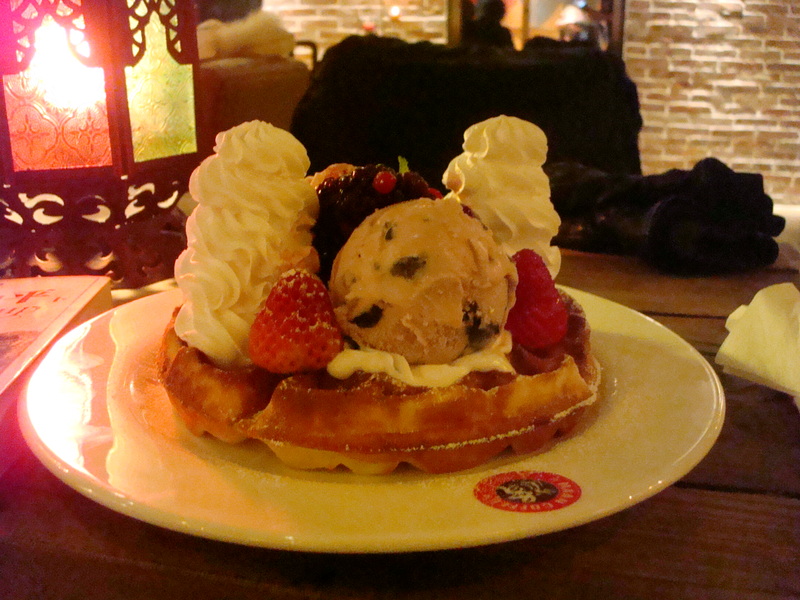 Seoulites took the Belgian waffle concept, added mountains of ice cream and fruit, and turned it into a delicious late night snack. And now, naturally, it has found its way to Wudaokou. If you can’t visit Seoul, come here. On the middle shelf to the far left is my favourite so far: the chocolate waffle, with chocolate ice cream and a little fruit syrup. 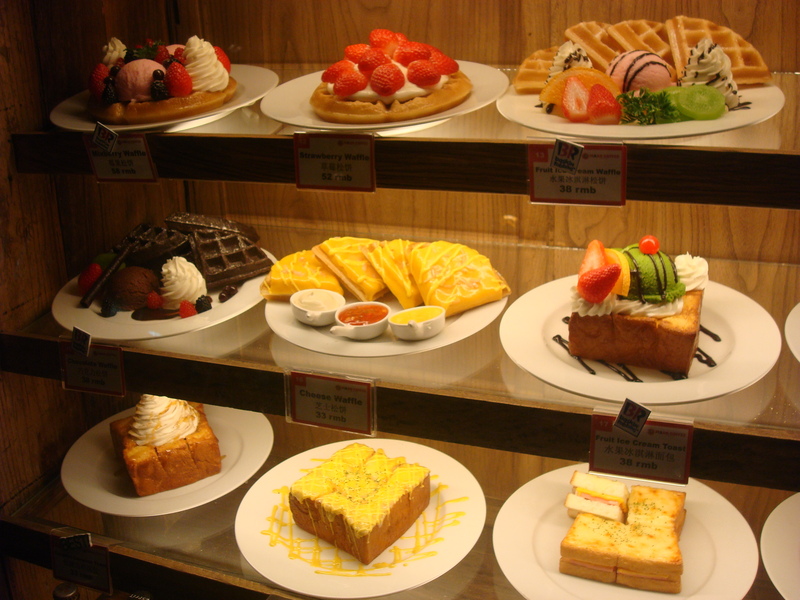 You can also see strawberry toast, honey toast, and the strange-looking “cheese waffle”, which I don’t plan to try. If you have a sweet tooth like me, there’s nothing more satisfying…although this is a lot of waffle and definitely needs to be shared. The waffle is very good quality (I noticed while we were ordering that they have proper waffle irons, so it’s made fresh) and so is the ice cream, as good as Ben & Jerry’s in my opinion. This particular waffle had one scoop of strawberry and one of cherry. Drinks were also very good – the fresh orange juice was 32 RMB but well worth it. They also have Snapple! Next time I visit, I’ll definitely try their affogato. Maan Coffee’s one problem and the reason I might come here less often is that the decor, which is somehow both elegant and very over-the-top cute. That gimmick they have of giving you a teddy bear so the servers can match your order to you – it’s kinda funny, but makes me feel stupid. But between decor and food, food always wins at least for me. 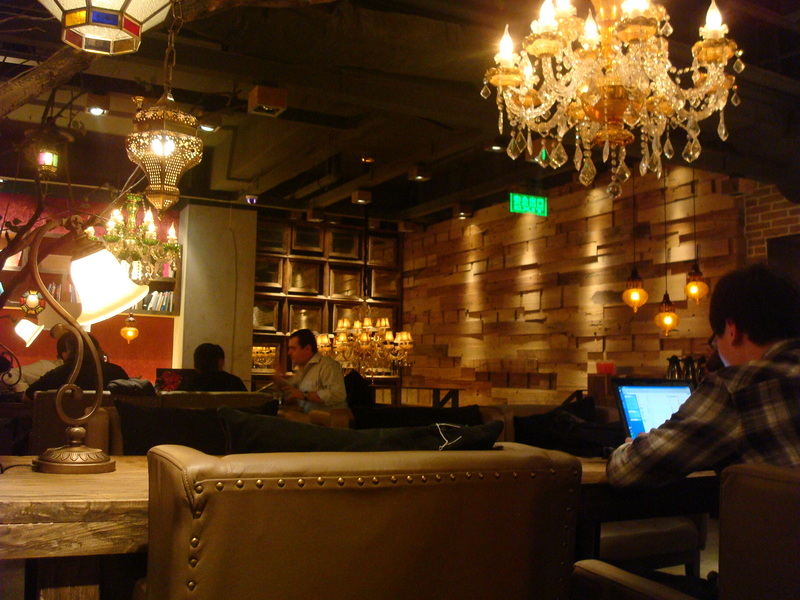 So until further notice, I’ll call Maan Coffee the best study spot in Wudaokou. On the west side of Wangzhuang Lu, north of Chengfu Lu. From Wudaokou subway station, walk east and take the first left. (I actually linked to Kaorou Le, which is across the street. Google Maps doesn’t know about Maan Coffee yet. Don’t worry, the storefront is large and you can’t miss it). Open until 2 a.m. daily. See link for a map.